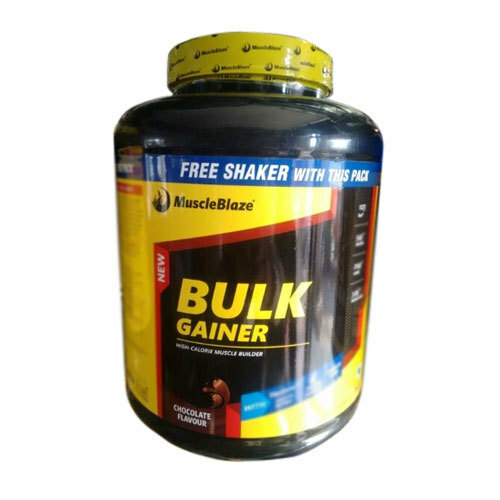 We are successfully meeting the varied needs of our patrons by offering a wide gamut of 6 lbs Muscleblaze Bulk Whey Protein as per their precise needs. it is best suited for serious mass gain training. Added DigeZyme enzyme blend aids in easy assimilation of the protein into body. High quality complex carbohydrates restrict the sudden rise in blood sugar levels. High calories and rich proteins boost muscle development. 27 vital nutrients present in this supplement stimulate bio-chemical reactions to quench muscle fatigue after exercise. Supplement has added Creatine to improve the endurance and strength. Established as a Sole Proprietorship firm in the year 2011, we “Gold Nutrition” are a leading Wholesale Trader of a wide range of Protein Powder, Weight Gainer, etc.. Situated in Ghaziabad (Uttar Pradesh, India), With the support of our vendors, we are able to provide these products in diverse specifications within stipulated time period. We offer these products at reasonable rates and deliver these within the promised time-frame. Under the headship of our mentor “Mr. Anuj Sharma”, we have gained a huge clientele across the nation.